British singer, pianist and guitarist Mike Sanchez is one of the most charismatic performers of Rhythm & Blues and Rock n’ Roll in the UK. 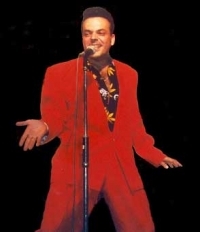 He presents an indelible image as a frenetic front man, pumping powerful boogie-woogie piano in a soaking red suit and his big personality has won him fans from across the road. Previously a full time member of Bill Wyman’s Rhythm Kings, Mike is now involved in a number of different projects, including his own Rhythm & Blues Revue – a 1950’s style show featuring doo-wop trio The Extraordinaires. Mike’s main aim has always been to make every live show his best. He enjoys growing acclaim and admiration for his electric performances.